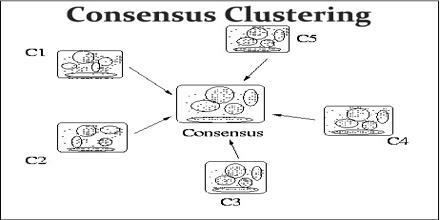 Consensus Clustering is exposed to the risk of incorporating the biases and preconceptions of the analyst because it does not provide for an “objective” criterion to establish the number of clusters and the clusters’ boundaries. It was also called aggregation of clustering, refers to the situation in which a number of different clusterings have been obtained for a particular dataset and it is desired to find a single clustering which is a better fit in some sense than the existing clusterings. It is known as median partition, and has been shown to be NP-complete.